Make the most of every opportunity. 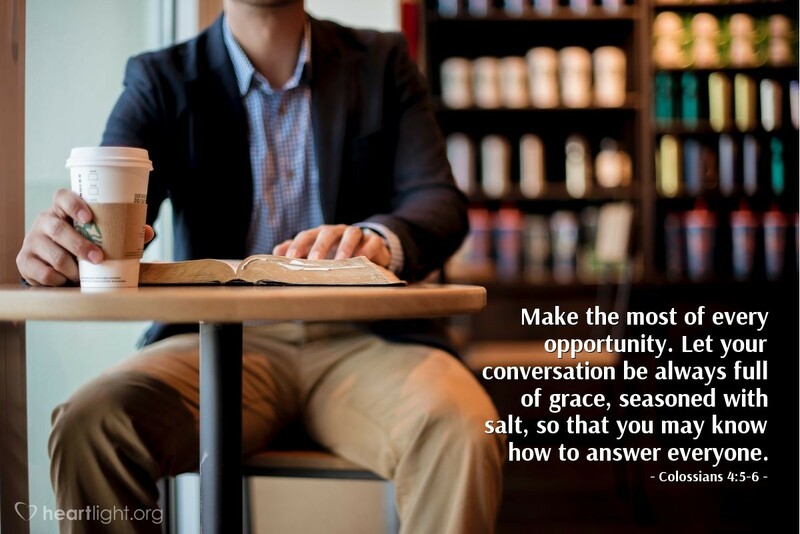 Let your conversation be always full of grace, seasoned with salt, so that you may know how to answer everyone. There are no random acts of kindness, only intentional acts given the opportunity to happen. We have thought about kindnesses we can do. We have committed ourselves to acting in ways that are kind and beneficial. We have prayed for an opportunity to be kind. Then the opportunity presents itself and bingo! We act with kindness. Nothing random about that! This is true not just in deeds, but in words as well. More than trying to avoid poor speech, we are urged to use our speech to bless and help others to come to know Christ. Father, please forgive me for the careless words I have uttered this week. I understand that these careless words are twice sins — a sin once when I committed it and a sin a second time because I didn't see the opportunity to be redemptive and helpful with my speech. Open my eyes Lord so that I may see those people you have placed in my path to bless. Through the blessed name of Jesus I pray. Amen.